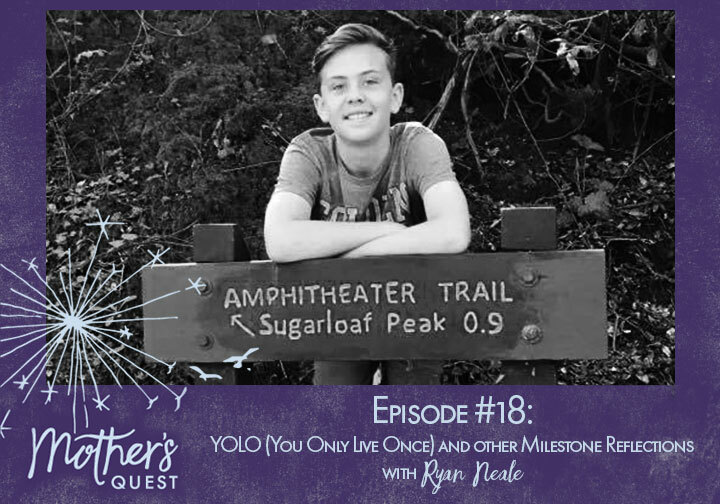 I’m so honored and excited to bring you this Episode #18 of the Mother’s Quest Podcast with a very special guest, my own son Ryan Neale. One of the great lessons I’ve learned is the importance of marking milestones and honoring endings so that you can thoughtfully open a new chapter. As Ryan approaches his bar mitzvah in April, becoming a “Jewish adult” and entering his teens, we decided we would spend his thirteenth birthday together, going on a “milestone hike” ‘and then recording an episode of the podcast at a recording studio in San Francisco. It was a magical day of reflection, revelations for both of us, and a lot of laughter. I’m honored to bring highlights of all of that to you through this episode. You’ll hear Ryan share eloquently and honestly about his appreciation for the support that helped him conquer his developmental delays, how his own fears manifest in his life today, and how, in his next chapter, he wants to trust more and move through his fear. Because, he says, he wants to live with a YOLO (You Only Live Once) mindset. Ryan reflects on snapshot moments from his life, about his deep love for his younger brother, his experience finding a group of friends and a school program where he could thrive, receiving the academic achievement award, and the moments he hopes he’ll be able to look back on with pride at the next milestone. Ryan also gets a turn to ask me his own questions and give me feedback. I had an opportunity to share the biggest lesson my mother gave me, to always appreciate every stage of life you’re in when you’re in it, and acknowledge what I wish I could change about myself. I also heard Ryan reflect back that in being “a little selfish” in creating Mother’s Quest I’ve given him so much more than if I only focused on my children. There’s a game we play with Erik Newton (whose studio we recorded in) as our game show host, a lot of laughter and some comical out-takes that you’ll want to stick around for at the very end. I felt so blessed to create this experience with Ryan and to share it with you. I take with me the importance of marking these rites of passage thoughtfully with our children, what a privilege it is to be witness to the development of another human being as a mother, a reminder of how powerfully our children see and know us and help us grow, and what fun it can be to create new experiences together. Ryan and I will never forget how we spent his thirteenth birthday together. 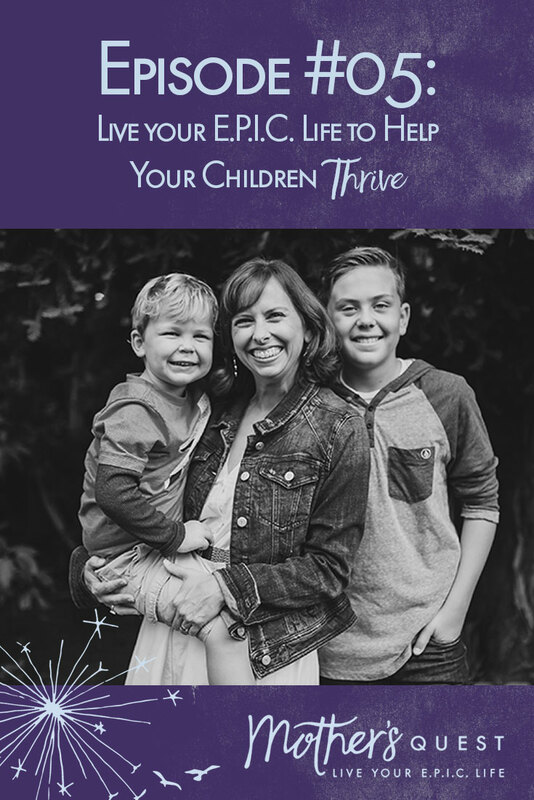 We hope you’ll leave this episode inspired to mark a milestone in your life, with your children, and make some life-long memories of your own. The GATE Program (Gifted And Talented Education Program) national links and background information. Ryan participates in our local school district’s program. I hope this conversation sparked something that will inspire you to mark a milestone in your E.P.I.C. life. If you live in the bay area and want to participate in a group milestone hike I will be leading this spring or if you want to sign up for a coaching session so I can help you mark a milestone wherever you are, send an email to julie@mothersquest.com and put milestone in the subject heading. The season is coming to a close and will start up again in May. Please make sure you’ve subscribed, signed up for email updates at mothersquest.com and joined the Facebook group so we can keep in touch and you’ll get notified when the next episode comes out. Be Part of the Finale!! I’ve extended the deadline for your submissions to be featured in the finale through April 6th and will release the finale later in April. So, if you haven’t yet called in, and there is a moment from the season that made a difference for you, please go to mothersquest.com, look for the purple phone icon, and leave me a message with your name, favorite moment from the podcast and how that moment impacted you. I would love to include your voice in the season finale.